Looking for the death of a travelling ancestor? Perhaps our index can help. We’re currently building up a collection of extracts from burial registers and death certificates that we’ll add regularly to this page. Some will be open to the public but most will be in a new members-only area of this site, currently under development. So please check back soon. And if you have any to share, please contact us. 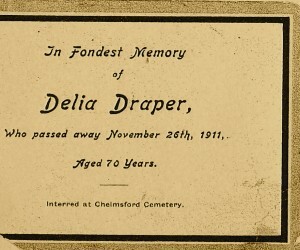 The memorial card of Delia Draper (nee Taylor), the widow of James Draper, who died on 26 November 1911 and is buried in Chelmsford Cemetery, Chelmsford, Essex. It’s always best to check the original registers for accuracy as we receive contributions for this list from many different individuals and sources. To protect the privacy of individuals, we only publish death and burial information from before 1965. Buried 5 June 1597, St Margaret with St Nicholas, Norwich, Norfolk, base born daughter of a Scotts shoman [sic]. Buried 6 August 1768, Dulwich College, Dulwich, Kent, Queen of the Gipseys. Buried 22 September 1866, Turvey, Bedfordshire. A Traveller. Aged 35. Inquest Cople. Died 30 September 1957, Little Testwood Garage, Totton, Hampshire. Aged 89 years. Haulage Contractor (retired). Cause: Myocardial degeneration/Arteriosclerosis/Bronchitis. Informant: A. Brewer, Grandson, of 2 The Drove, Harton Heath, Eastleigh. Died 25 November 1923, Haymeads, Bishop Stortford [Hertfordshire/Essex]. Aged 39 years. Of Henham Stansted R.D. Widow of Frank Bentley, a Farm Labourer, an Army Pensioner. Cause of death: Uterine Cancer. Informant: N. E. Friend, Occupier, Haymeads, Bishop Stortford. Buried 16 August 1839, Bedingham, Norfolk, a Gipsy who died in the parish of Bedingham. Aged 50. Buried 1 November 1798, North Luffenham, Rutland. An infant, str of Shillingworth Boswel, a Vagrant Gipsy. Buried 11 March 1864, Holy Trinity, Anslow, Staffordshire. Described as being of Stones Grove, aged 5. In margin: ‘a Gypsey’. Buried 16 October 1719, North Runcton, Norfolk, son of strolling Gipsey, buried from Setchey. Interested in Boswells? Don’t miss our Boswell books here. Buried 23 February 1799, North Luffenham, Rutland, a Vagrant Gipsy Woman. Buried 6 November 1886, St Michael’s, Litchfield, Staffordshire. By coroner’s order. Aged 11 months. Abode: none. Died 21 February 1861, Brindle, Lancashire, aged 100 years, widow of Tiso Boswell, a Soldier. Cause of death: Natural Decay, No Medical Attendant. Informant of death: X The mark of Edward Boswell, Present at the death, Brindle. Buried 28 March 1864, Holy Trinity, Anslow, Staffordshire. Described as being of Anslow Legs, aged 3. In margin: ‘a Gypsey’. 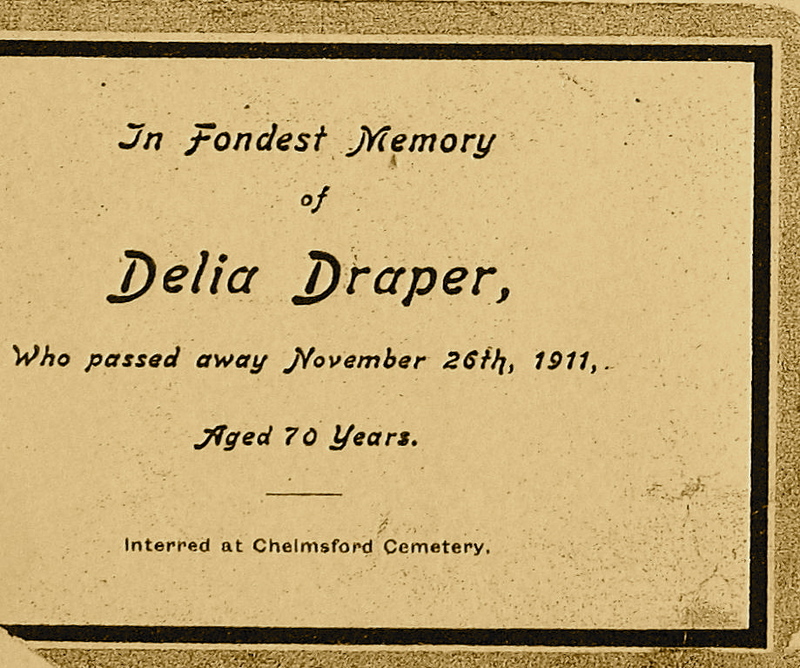 Buried 12 December 1882, Thorpe next Norwich, Norfolk, aged 32, of the Asylum, Thorpe. Died 3 April 1948, The Barton, Clyffe, Pypard, Wiltshire. Hawker and General Dealer. Aged 84 years. Cause: Cardiac Failure/Acute Bronchitis. Informant: W. Hughes, Son-in-law, Hollow Street, Gt Somerford, present at the death. Died 29 December 1948, The Barton, Clyffe Pypard, Wiltshire. Aged 75 years. Widow of Sydney Buckland, a General Dealer. Cause: Cerebral thrombosis. Informant: W. Hughes, son-in-law, of Hollow Street, Great Somerford, Wilts. Interested in Bucklands? Don’t miss our Buckland Family Tree book here. Died 6 February 1906, In a van at Stratton St Margaret, Swindon, Wiltshire. General Dealer. Aged 80 years. Cause: Phthisis. Informant: Henry Buckland, Son [signs X]. Present at the death, of Lower Stratton. Buried 2 November 1763, Albury, Oxfordshire, son of a Gipsy. Buried 22 April 1902, Hayes, Middlesex, aged 81. Buried 1 November 1849, Cople, Bedfordshire, aged 62. [GRO death index lists her name as Marella]. Buried 30 May 1879, Hagbourne, Berkshire, of Hagbourne Down, gypsey child, aged 1 year 6 months. Death certificate states: Died 5 February 1838, St David, Brecon, Wales. Aged 18. Occupation: Gipsy. Cause of death: Smallpox. Informant of the death: Thomas Morgan, Relieving Officer, Brecknock. Buried 6 February 1838, churchyard of St David, Brecon, Wales. Aged 18 years. A Stranger. Abode: Heol Hwant. Buried 9 December 1833, St Mary’s, Walmer, Kent. Aged 4 months. A Gipsy child. Died 8 January 1908, Promenade, Portobello, Edinburgh, Scotland. Married to John Evans, Hobby Horse Proprietor. Aged 58. Parents: John William Hazard, Hobby Horse Proprietor (deceased) and Helen Hazard, maiden surname Davis (deceased). Cause of death: Cerebral Haemorrhage, Hemiphagia – 1 day. Informant: Christina Evans, Daughter, Present. Died 9 October 1915, Elliot Street, Edinburgh. Amusement Caterer. Widower of Charlotte Hazard. Aged 71. Parents: William Evans, Coal Pitman (deceased) and —— Evans, maiden surname ——— (deceased). Cause of death: Pulmonary Congestion 8 Days, Cardiac Failure. Informant: Isabella Evans, Daughter-in-law, 1 [illegible] Place, Portobello. Buried 5 October 1896, Hagbourne, Berkshire, [of] van in Mr Dixon’s Yard, aged 24. Buried 14 April 1839, Hawsted, Suffolk, of Oakington, Cambridgeshire, aged 24. Buried 22 October 1859, Willingham, Cambridgeshire. Buried 16 August 1862, Mattishall, Norfok. Gipsy from Hanningsea, Cambridge. Aged 40. Buried 18 October 1811, Hatley, Cambridgeshire. A travelling tinker belonging to the parish of Burwell who died in a barn in this parish after a sudden illness. Buried 16 November 1801, West Deeping, Lincolnshire, a gypsey. Buried 29 May 1800, Horsell, Surrey, Fiddler. Death certificate states: Died 17 July 1916, 25 Atkinson Street, Preston, Lancashire, aged 58 years, Horse Dealer. Cause of death: Valvular Disease of Heart. Informant: Amy Smith, Daughter, 35 Queen’s Road, Blackpool. Buried 4 January 1833, Compton, Berkshire, aged 80, vagrant. Buried 25 Match 1874, St Mary’s, Battersea, London. Aged 60. Address: The Gipsy’s Camp, Orkney Street. Died 18 March 1929, Haymeads, Bishop Stortford [Hertfordshire]. Aged 75 years. Address: The Row, Henham, Stansted R.D. [ie, Registration District]. Cause of death: Senile Decay, No P.M. [ie, no post-mortem]. Informant: N.E. Friend, Occupier, Haymeads, Bishop Stortford. Died 13 February 1961, St Albright’s Hospital, Stanway [Essex]. Aged 88 years. Widow of Israel Loveridge, a Grinder and Umbrella Repairer. Cause: Senility. Informant: A. L. Woods, Occupier, St Albright’s Hospital, Stanway, Colchester. Interested in Loveridges? Don’t miss our Loveridge Family Tree book here. Buried 9 November 1816, Cold Ashby, Northants. Gypsy, died in Coal Pit Lane, aged 90. Interested in Lovells? Don’t miss our Lovell Family Tree books here. “The oldest travelling gipsy in the North of Scotland, has died, after a few days’ illness. Aged 101”. Death certificate states: George MacPhee, Travelling Tinsmith, married to Mary Wilson. Died 27 February 1895, 99 Shore Street, Cromarty, County of Ross and Cromarty. Aged 99 years. Parents: George MacPhee (deceased), Travelling Tinsmith, and Nancy MacPhee, maiden surname Wilson (deceased). Cause of death: Pneumonia, 4 days. Informant: George MacPhee (his mark X), Grandson, Present at death. Buried 6 October 1818, Great Barford, Bedfordshire, aged 2 years. Traveller. Died 11 January 1931, The People Home, Saffron Walden [Essex]. Aged 82 years. Address given as Broxted. Spinster of no occupation. Daughter of William Ellice Parker, a Hawker (deceased). Cause of death: Senile Decay, Influenza. No P.M. [ie, no post-mortem]. Informant: Mrs H. Prior, Occupier, The Peoples Home, Saffron Walden. Buried 5 October 1838, Turvey, Bedfordshire. Of Bletsoe. Traveller. Aged 48. Buried 5 April 1709, Astwell, Oxfordshire, daughter of Mary of Amwell, Herts, beggar. Buried 27 September 1837, Thurton, Norfolk, of Pockthorpe in Norwich, aged 16. Buried 6 February 1838, Hagbourne, Berkshire, of West Hagbourne Down, Traveller’s son, aged 12. Died 24 June 1957, The Caravan, Bath Road, Chippenham, Wiltshire. Aged 58 years. General Dealer. Cause: Carcinoma of the antrum. Informant: A. Saunders, Son, of The Pike House, Christian Malford, Chippenham. Died 5 November 1947, The Caravan, The Isolation Hospital, Chippenham, Wiltshire. Aged 48 years. Wife of Charles Saunders, Wood Merchant. Cause: Cardiac failure/Malignant hypertension. Informant: X The mark of Charles Saunders, widower of deceased, present at the death, of The Caravan, The Isolation Hospital, Chippenham. Buried 8 September 1676, Watton, Norfolk, a Stranger and Travilleur. Died 13 March 1883 (8 hours 0 minutes A.M.), 142 [?] Westmuir Street, Glasgow, aged 2 1/2 years. Son of Noah Slender, Licensed Hawker, and Mary Slender, maiden surname Muirhead. Cause of death: Diptheria, 1 month. Informant: Noah Slender, His mark X, Father. Buried 20 February 1748, West Winch Norfolk: A Stranger. Affidt made by Elizth Bailey. Buried 15 December 1723, Glasbury, Breconshire, son of Jeffery and Damaris Smith, travelling people. Died 5 August 1918 in the Union Infirmary, Devizes, Wiltshire. Spinster. Aged 80 years. Hawker, of Hare & Hounds Court, Devizes. Cause: Senile decay/Gastric influenza. Informant: W. Fear, Master of the Union Workhouse, Devizes. Buried 2 September 1835, East Harling, Norfolk, a strolling beggar. Buried 3 November 1843, Turvey, Bedfordshire. Of Bletsoe. A gipsy Child. Aged 4. Interested in Smiths? Don’t miss our Smith Family Tree book here. Buried 23 October 1877, Princes Risborough, Buckinghamshire, aged 3 weeks, [abode] Travelling Caravan at the Fair. Died 29 December 1924 aged 39 years. Buried at Gorleston Cemetery, Norfolk. Gravestone commemorates Leo and his parents: Walter Smith and Matilda Smith (nee Gaskin). Died 22 December 1927 aged 88 years. Buried at Gorleston Cemetery, Norfolk. Gravestone commemorates Matilda Smith (nee Gaskin), her husband Walter Smith and their son Leo Smith. Buried 26 July 1798, Newton Longville, Buckinghamshire, a gipsy. Buried 23 October 1843, St John the Baptist, New Windsor, Berkshire, aged 25, Frogmore Road. Buried 8 March 1801, Wilstead, Bedfordshire, an Egyptian. Died 1 November 1921 aged 83 years. Buried at Gorleston Cemetery, Norfolk. Gravestone commemorates Walter, his wife Matilda Smith (nee Gaskin) and their son Leo Smith. Buried 9 May 1844, Digby, Lincolnshire, aged 6. Buried 23 May 1742, Durston, Somerset, the Egyptian. Died 17 July 1889, Blackpool, Lancashire. Buried in Layton Cemetery, Blackpool. Death commemorated on a headstone. Buried 10 May 1894, St Mary’s, Walton on the Hill, Liverpool, Lancashire, [abode] Gipsies Tent, City Road, Walton, aged 2 days. No baptism.